Understanding sequencing of events is an important early step in everything from reasoning skills and daily routines to reading comprehension and storytelling. Our sequencing events worksheets will help your child practise putting pictures of events and stories in their logical order, choosing the best story endings based on events, creating story maps, and using transition words to understand and convey order of events. A lot can happen in one day! But in what order does it all happen? 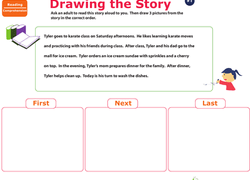 practise story sequencing your daily routine with this cut and paste activity. Kids recall important details from a story in this listening comprehension worksheet. Kids demonstrate their sequencing skills in this worksheet. This worksheet helps reception students practise sequencing in a hands-on way, by learning about the importance of morning routines. In this assessment worksheet, students demonstrate their knowledge of sequencing events. Practise putting things in order with your early learner! Help him cut out the scenes and decide what happens first, next and last. Hot Lava! What Happens Next? Searching for a worksheet to help your budding, young scientist? This printable will help with her with reasoning skills. What happens before breakfast? After lunch? Help your preschooler sort out the concept of before and after with this matching worksheet. 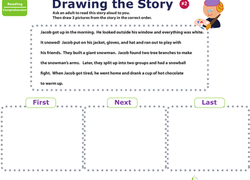 This story sequencing worksheet helps with reading comprehension, listing, and even artistic skills! Put things in order from first to last! A big part of pre-reading comprehension is learning to put events in order. This printable will help your budding astronaut practise her reasoning and sequencing skills. People change all the time, and so do their likes and dislikes! Help your little one understand the concept of "then and now" with a fun drawing activity.